Light in hand with high line speed, and loads of feel, Radian two handers are perfect for anglers who prefer “touch and go” casts and an up-tempo stroke. They deliver power smoothly and load progressively so whether you’re fishing a close lie against the bank or a seam on the far side of the river, Radian two handers maintain their feel and loop control exceptionally well. Fit with the finest components of any two hander, these rods are equally impressive for their craftsmanship. Reel seats are milled from aluminum bar stock and treated with type 3 hard coat in flat black. Stripping guides are titanium with SiC rings complemented with Snakebrand Universal snake guides. Grips are turned from the best cork of the harvest. The perfect rodfor modern river techniques with Scandi style shooting heads or long bellies. It has progressive power allowing for compact casts off the tip to fully loaded casts that use the whole rod to propel line great distance. 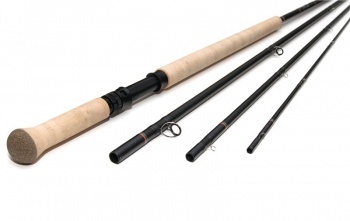 This rod balances light in the hands and casts tight clean loops effortlessly. Spot on for fishing Scandi style floating or sinking lines in the summer with feel and accuracy. When long distance casts are called for but you don’t want to jump up to 9 or 10 weight rods, this is the choice. The backbone of the Radian lineup. This is really the "go to” rod that anglers should have in their arsenal. It feels super smooth with all Scandi style lines, either floating lines and smaller flies, or it handles the heavy sinking lines and larger flies better than other rods. If you need to cover lots of water and fish different water depths, this model is a great choice. The backbone of the Radian lineup. This is really the "go to” rod that anglers should have in their arsenal. It feels super smooth with all Scandi style lines, either floating lines and smaller flies, or it handles the heavy sinking lines and larger flies better than other rods.If you need to cover lots of water and fish different water depths, this model is a great choice.